On October 12, 1494, Christopher Columbus, an Italian sailor landed in the Bahamas, part of the Americas. To celebrate this arrival, Columbus Day was established. This day is also celebrated as Dia de las Americas in Belize and Uruguay. It means ‘Day of the Americas’. These celebrations have been in place since the late 18th century. Columbus was given three ships by the city of Palos when he set sail for the expedition. Those three ships were the Nina, the Pinta and the Santa Maria. His crew consisted of a total of 90 men. He was the first ever European since the 10th century to have an opportunity to explore the Americas. Christopher Columbus was Italian so Italian-Americans celebrate the day as a celebration of their heritage. There are no portraits known to exist of Columbus. So nobody nowadays is quite sure how he looked. The main goal of his expedition was to chart a western sea route to India and China as well as to the islands in Asia with spices and gold. The very first Columbus Day was organized by the Society of St. Tammany and held in New York City. On April 7, 1907 Colorado became the first state to declare Columbus Day as a legal holiday. The Republic of Columbia in South America and The District of Columbia in the United States are named after Christopher Columbus. New York City has the largest parade on Columbus Day. In Puerto Rico, this day is celebrated along with Puerto Rico Friendship Day and in Virginia, with Yorktown Victory Day. Columbus is believed to have directed violence at Native Americans. Declan, Tobin. " 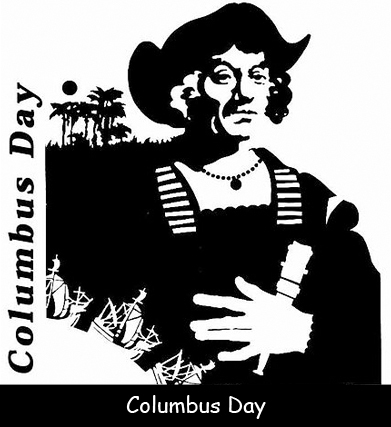 Fun Facts for Kids about Columbus Day ." Easy Science for Kids, Apr 2019. Web. 25 Apr 2019. < https://easyscienceforkids.com/columbus-day/ >.